The APVMA registration process is evidence based, and APVMA satisfaction is reliant on provision of information to address statutory criteria to support the intended product, use or claim. Generating information requires an investment (time, money, emotion), and those in commercial operations realise there are limits to all of these. The objective is to generate information with sufficient scientific value and integrity to address the statutory criteria within the limits of the available resources. We spend a lot of time in this space, and get results. We’ve included a diagram and some comments to illustrate our thought processes as we formulate a risk-based development strategy for a client. The APVMA have to consider there is a potential risk associated with every product that meets the definition of Agvet chemical1. The APVMA are empowered under Section 1A (2)(b) to implement the Agvet Code such that it reflects established best‑practice principles for the assessment and management of risk, based on science2. Part of this strategy is the product risk assessment conducted on receipt of an application. We are mindful that this risk assessment is the first opportunity for the APVMA to identify the type of information that it would require to be satisfied that the product application meets the relevant statutory criteria. It is also the first critical review of your development strategy. Unfortunately, this occurs behind closed doors, and there is little information available about the actual process other than to say your application is assessed on its merits. With all of the applicant’s investment committed upfront, it is therefore essential to the success of the application that the applicant’s assessment of risk at the commencement of a development program, is similar to the APVMA’s risk assessment which occurs after application submission. With that understanding, applicants can build the application quality to address the risk. A successful strategy defines the point where regulatory burden addresses regulatory risk. Applicants are well aware that with every application, there are real-world limits to available science, time and money which will apply. At submission, there is a section on the line where applicants cannot be certain they will produce an application that can withstand the rigor of the evaluation process. Inevitably, there will be a disparity between the information presented to support the application or claim and the level of absolute certainty to address the APVMA perceived risk to safety, efficacy and trade. We differentiate our service through the success we have getting to the satisfaction point by appealing to the APVMA’s risk appetite. I define this as how much risk the APVMA is willing to absorb when they register an active or chemical product. This is an integral part of the application – it isn’t just words on paper, it expert negotiation, advocacy, direction and advice throughout the registration process that gets it over the line. From our perspective, for those who persist with development, we appreciate the faith and support of our clients who have trusted us to see their projects through. 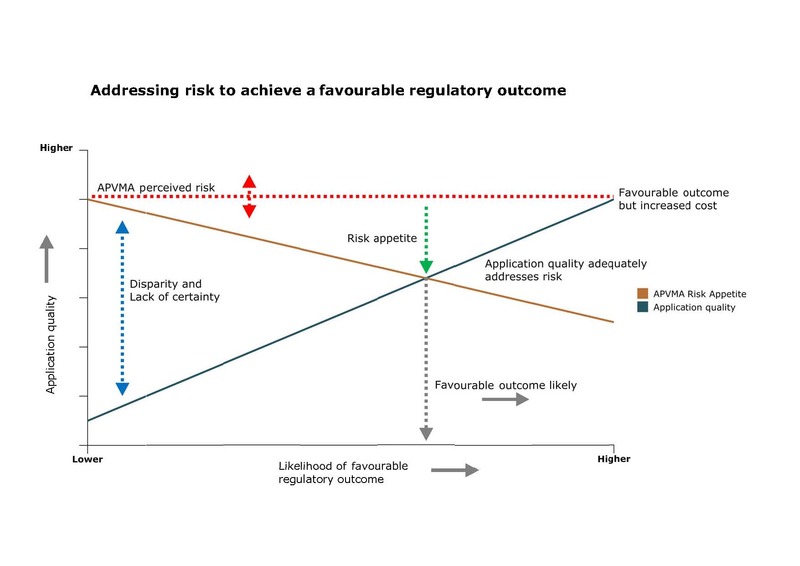 By understanding the risk, and using science and technical argument to appeal to the APVMA’s risk appetite, we’re improving certainty and getting favourable outcomes from the regulatory review process. We’re optimistic the changes to the APVMA, including their risk culture, in the next few years will have positive effects for our industry. Read on about our thoughts on how we can influence this in our article on the Top 20 project.. If you have ideas, or concepts to explore, we’re always available to discuss your development needs and work with you to define the strategy which is based on the fundamentals discussed above – identifying risk and working towards the satisfaction point to improve the certainty of reaching your development objective.